Globalsat participated, once again, at Andicom in Colombia — the company brought together experts from the firm's regional offices as well as strategic partner Iridium to present what is coming in mobile satellite technology, thanks to Iridium Certus through the firm's local subsidiary, Globalsat Colombia. 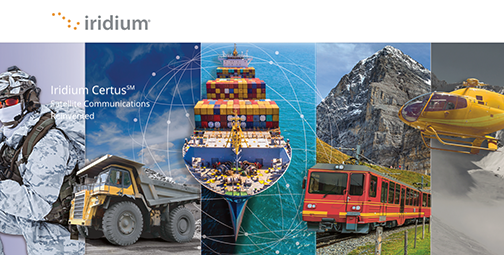 Iridium Certus, the new mobile satellite service, comes into operation due to the complete modernization of the Iridium low-orbit satellite fleet, known as the Iridium NEXT constellation. Certus will begin with speeds of 352 Kbps (symmetric in some terminals) which, during 2019, will increase to 704 Kbps, surpassing other offers in L-band and presenting an attractive profile for military and civil mobile communications of critical mission, capable of operating — even at the poles. Iridium is just one release away from completing the deployment of its new constellation. The company expects that the pending launch will occur before October — a few weeks late, all of the satellites will be in position to provide global, uninterrupted service of 352 Kbps, in addition to the total continuity of legacy Iridium voice and data services, including SBD and PTT . With their presence in Andicom 2018, Globalsat presented on-site demonstrations of all high-portability satellite solutions for voice, data and also communication-oriented M2M / IoT systems, including the mobile and M2M / IoT solutions that are based on L-band (1-2 GHz), which allows voice and data communication with coverage throughout the Colombian territory under any type of critical condition, including earthquakes, rains intense, power cuts and infrastructure falls, using low-weight equipment and low consumption. In addition to the traditional offer of mobile satellite services, Globalsat Group offers and operates systems with additional layers of security, interoperable satellite PTT ("Push to Talk") solutions with tactical radios, high portability audiovisual streaming solutions. Plus, Globalsat Group provides, at no additional cost, the firm's self-administration cloud based portal, AirtimeSat, which is ideal for government clients and other mission-critical organizations to efficiently manage their terminals and optimize the use of services to be cost-effective and be available when and where they are needed. 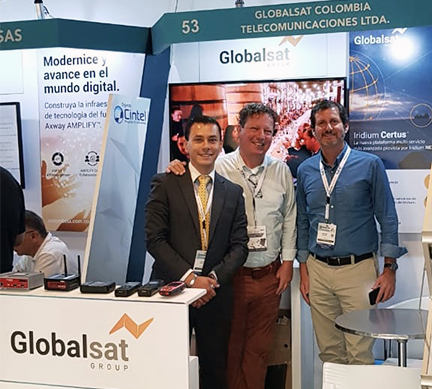 Elkin D. González, Country Manager of Globalsat Colombia, said that both the attractive price of the equipment as well as its mechanical simplicity and the resulting immunity to movement, have Iridium Certus generating excitement within the Colombian market. Note that Globalsat Group is one of the first five companies worldwide to start beta testing of the service using Thales MissionLink terminals, which allows Globalsat to become familiar with Certus early, as well as providing valuable field information to both Thales as to Iridium for the optimization of the experience of the final users .